Corporate governance is an essential system that ensures an organisation runs smoothly, professionally, and consistently. 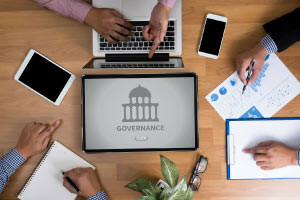 This course will give you a strong understanding of how to set up a robust corporate governance both through internal and external governance systems. You will also learn how laws, regulations, and market forces play important roles in corporate governance, and how governance systems can ensure corporate fairness. In this course, you will learn how to describe the systems and the rules that define an organization’s behavior. You will also gain an understanding of both the internal and the external forms of governance that affect an organization. This will include a discussion of how external governance through state laws, market forces, and regulations ensures corporate fairness. The course will then show you to guarantee an organization acts reasonably, ethically and within the confines of the law. Next, important concepts regarding normative isomorphism, mimetic isomorphism, and coercive isomorphism will be discussed. You will learn how corporate governance systems manage product quality and consumer expectations, and how to set up best practices for matching and exceeding the quality of your competitors. Finally, the course will discuss watchdog organizations which protect the public interest. This section will show you how watchdog organizations police companies which conduct unethical and illegal practices. By taking this course, you will gain a much stronger understanding of the rules, practices, and processes which direct organizations. You will also become more aware of the balance that exists between stakeholders, suppliers, management, financers, government, and other important groups. This knowledge will be highly beneficial for aspiring business professionals and anyone who wants to work in top management positions. So get started, and gain a great boost for your résumé today. Define internal governance and describe its purpose and significance. Show how governance is established in an organization. Explain the use and role of policies and procedures. Explain how organizational culture is established and how it influences behavior. Explain the role of the owners (or its Board representatives) and Management in governance. Define external governance and be familiar with the roles of stakeholders in governance of the firm. Describe how and why governments regulate business. Discuss how stakeholder groups act to shape the behavior of the firm. Identify the other significant influences on organizational behavior.